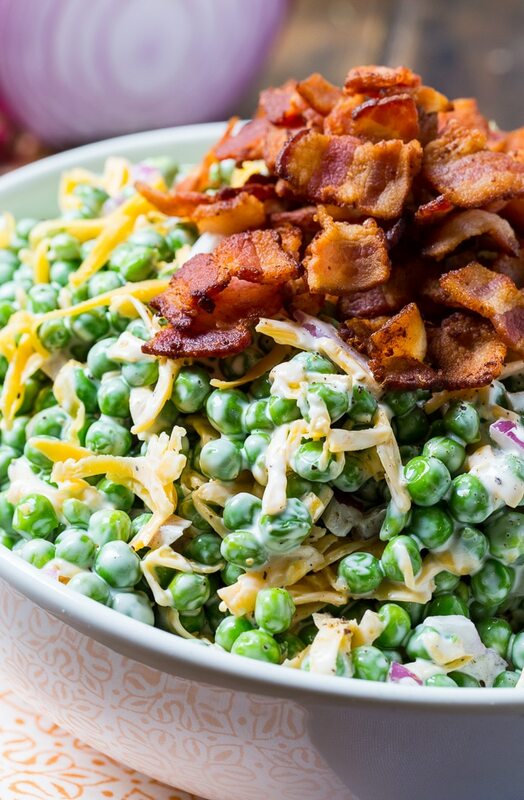 Creamy Pea Salad is a great potluck and bbq side for pea lovers. With just a few ingredients and a few minutes of time, a bag of frozen peas gets turned into a super flavorful vegetable side. 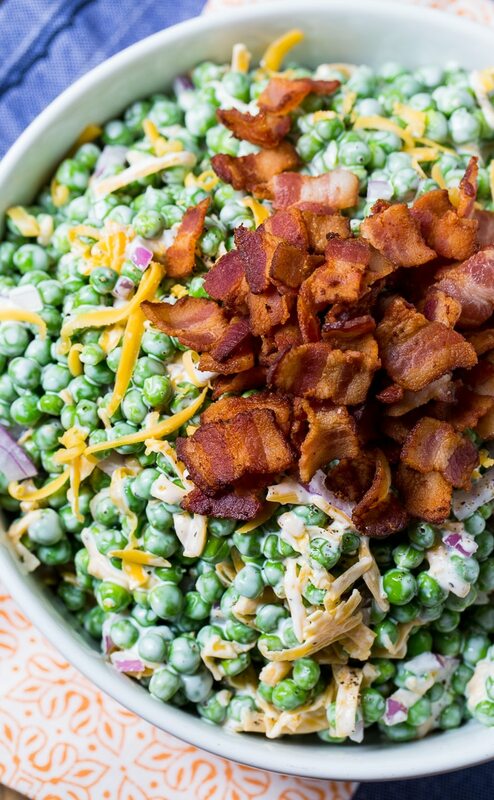 It’s creamy and flavored with lots of crispy, crumbled bacon, shredded cheddar cheese, and chopped red onion. 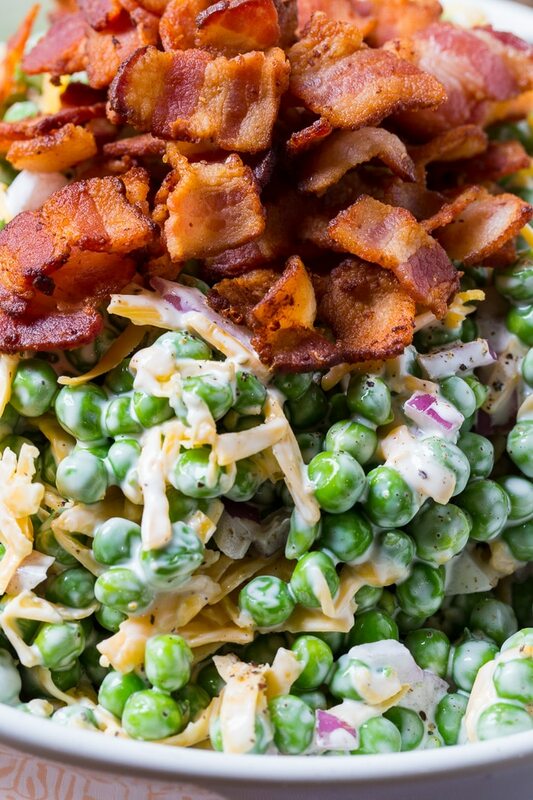 Creamy Pea Salad can be made a day or even two in advance. The flavor only gets better. Plus it tastes great when it is super chilled, especially on a hot summer day. A combination of mayonnaise and sour cream forms a super creamy base. A little apple cider vinegar perks up the flavor and a spoonful of sugar adds some sweetness. But the best part is definitely all that salty bacon! Creamy Pea Salad is flavored with bacon, cheddar cheese, and red onion. Makes a great potluck side! In a large bowl, stir together mayonnaise, sour cream, vinegar, sugar, and balck pepper. Add peas, onion, and cheddar cheese and mix well. Sprinkle bacon on top. Cover with plastic wrap and chill for at least 1 hour. 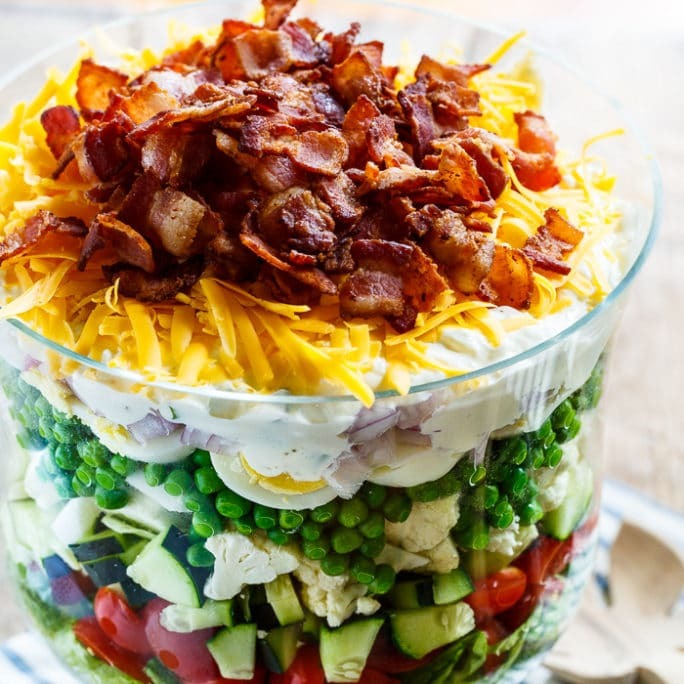 This entry was posted in Salads, Side Dishes and tagged peas, potluck. Bookmark the permalink. Can you use canned peas like LeSeur? 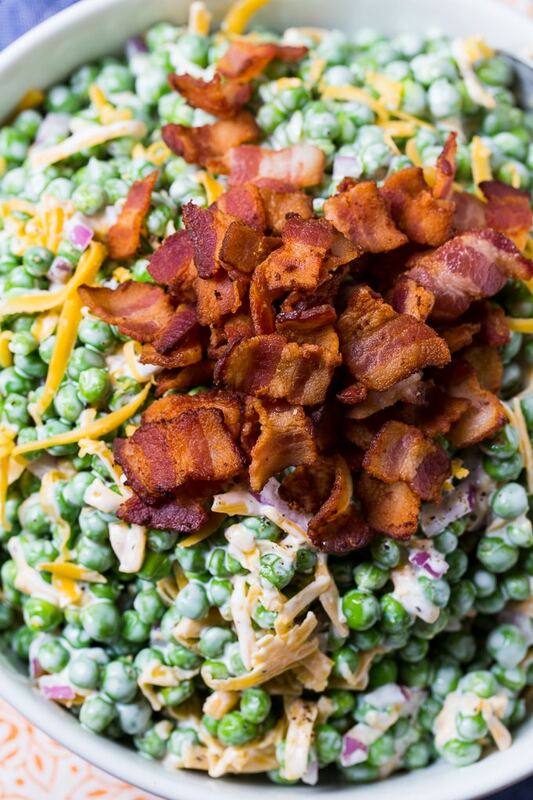 Yes, if you like canned peas you can use them. If you cook peas…..how long do you cook them? Do you put bacon on top before you refrigerate or at serving time? If I use frozen peas, I microwave them slightly less then the recommended time on the box or bag. You can put the bacon on top before refrigerating or just before serving. Whatever your preference is. Can I use frozen sweetlet peas? Cook or uncooked? Yes. I actually use frozen peas and microwave them. Just be careful not to cook them too long. No need to cook. Place in ice water when you do prep work. I add chopped boiled eggs in mine. So good. 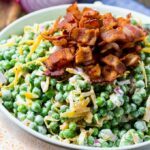 I would not cook the green peas as I don’t when using them in a seven layer salad and they are delicious! Fresh, frozen or thawed peas? I would partially cook the peas! I plan to make this.